Much shorter than that, actually. Only the subjects in the amp test could have developed listener fatigue. I'm not trying to be argumentative. I'm confused too, by one quote of the AES meeting having one number and Katz quoting every word exactly except using 83 instead of 85. And Katz is who arranged for the presentation to occur. And the AES version is Katz as well. I think the answer for Katz is in the appendix on the page I already linked. I quote it in blue below. Which still is odd and confusing. This page below is very clear regarding THX levels. As Tom Holman is the TH in THX, it looks like Katz made his own 3 db adjustment. And quoted while making that adjustment in his web posting. So it appears that 85 db SPL pink noise is the proper Reference level for large theaters. Maybe the 82 I've been using for years was a lucky happenstance for domestic rooms. All quoted monitor SPL calibration figures in this paper are referenced to -20 dB FS. The “theatre standard”, Proposed SMPTE Recommended Practice: Relative and Absolute Sound Pressure Levels for Motion-Picture Multichannel Sound Systems, SMPTE Document RP 200, defines the calibration method in detail. In the 1970’s the value was quoted as “85 at 0 VU” but as the measurement methods became more sophisticated, this value proved to be in error. It has now become “85 at -18 dB FS” with 0 VU remaining at -20 dBFS (sine wave). The history of this metamorphosis is interesting. A VU meter was originally used to do the calibration, and with the advent of digital audio, the VU meter was calibrated with a sine wave to -20 dB FS. However, it was forgotten that a VU meter does not average by the RMS method, which results in an error between the RMS electrical value of the pink noise and the sine wave level. While 1 dB is the theoretical difference, the author has seen as much as a 2 dB discrepancy between certain VU meters and the true RMS pink noise level. The other problem is the measurement bandwidth, since a widerange voltmeter will show attenuation of the source pink noise signal on a long distance analog cable due to capacitive losses. The solution is to define a specific measurement bandwidth (20 kHz). By the time all these errors were tracked down, it was discovered that the historical calibration was in error by 2dB. Using pink noise at an RMS level of -20 dBFS RMS must correctly result in an SPL level of only 83 dB. In order to retain the magic “85” number, the SMPTE raised the specified level of the calibrating pink noise to -18dB FS RMS, but the result is the identical monitor gain. One channel is measured at a time, the SPL meter set to C weighting, slow. The K-System is consistent with RP 200 only at K-20. I feel it will be simpler in the long run to calibrate to 83 dB SPL at the K-System meter’s 0 dB rather than confuse future users with a non-standard +2 dB calibration point. It is critical that the thousands of studios with legacy systems that incorporate VU meters should adjust the electrical relationship of the VU meter and digital level via a sine wave test tone, then ignore the VU meter and align the SPL with an RMS-calibrated digital pink noise source. Assuming these are musical selections rather than test tones, I use the Peter Walker criterion: for any given recording, there is one correct playback level. If I'm listening to an acoustic recording of a singer with a guitar, the level will be quite different than if I'm listening to a jazz quartet, and that level will be quite different than listening to an amplified rock band. I agree, but where your volume knob ends up is related to how much someone compressed the recording. You'd hope a singer and acoustic guitar not be highly compressed or overly close miked. But it happens too often. That's not the sort of recording I use for critical listening. You put it well - this sounds just about right from the real life situation how I do it. In theory you can use $100 fanless PC with BruteFIR convolver combined with this cute device. somehow it made me have another nice idea. Notch one channel of that low frequency, so no wave to cancel the other channel's wave. 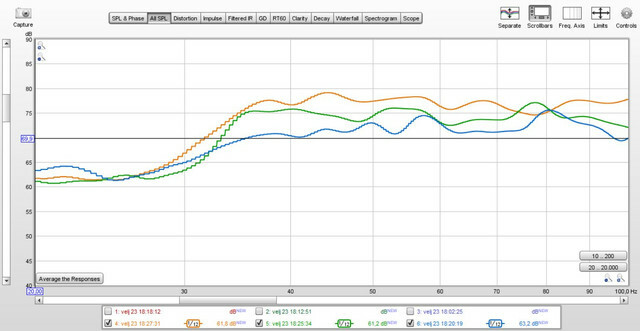 Two overlaid instances of a -16dB Q12 notch using IIR EQ #1 and 2 on the miniDSP 2x4HD that connects to the subs. Notch one side of the low frequencies, no wave to cancel the other side's wave. Yep, it seems it does! Your logic was very clear - if it isn't part of the solution it is part of the problem, so eliminate it! P.S. Sorry I didn't mention it when discussing phase compensation, but then, the pleasure is all yours as you made it by yourself - good work! P.P.S. Note to the guys who are new to EQ - narrow dip at app 220Hz is non-issue, as is obvious from red graph it doesn't need correction. As you can see I used the same technique to get smooth LF response. As my right speaker (blue) has problematic position I used left speaker (green) to carry the joined LF response (brown) so I didn't need to push right speaker over its limits. I guess Dirac (and similar alghorithms) still has some tricks to learn from us old farts..
P.S. My thanks goes to @pos and @andreasmaaan for helping me implementing this! I have no measurements to contribute here. I find that the source material, ie type of music +recording can make a difference. In the case of stereo, this becomes 82 dB SPL. For 5.1 it is 78 dB. Personally I like it as loud as I can get to hear low level detail. I agree with that strategy, but past a certain point it get hard to detect distortion in the loudest crescendos. My level is around 100 dB SPL, at which point personal discomfort or perceptual distortion is enough to mask distortion in the recording or playback. So the ideal level for critical listening ends up being a tradeoff between hearing low level detail, and hearing the loudest dynamic peaks clearly. Exactly. Our perceptual frequency response changes with loudness level, so natural acoustic sounds that are recorded, only sound realistic when played back at a level close to what they are in the real world. If played back quieter, they sound artificially muted or veiled; if louder, they sound artificially enhanced or enriched. Playing them back slightly louder than reality can provide a subtle enhancement, but if you keep increasing the volume, at some point they start to sound worse, not better. I shoot for playback levels that sound like I'm in a rehearsal with the musicians, or listening to them from the closest seats. Those are actually 2 different sounds! When I measure this with an SPL meter, average levels tend range from the low 60s to mid 70s with the loudest crescendos in the high 80s to low 90s. I concur whole heartedly. I've had the good fortune for multiple front row center seats at the Cleveland Orchestra. I've captured the same findings with a SPL app on my phone on multiple occasions and pieces. I feel exactly the same way about reproducing the music at home. For music with good dynamic range, I like peaks no more than 90-95. If its loud compressed rock music, I can only tolerate AVG db around 55-60 for long periods, otherwise I fatigue in short order. Sounds contradictory to the testing done by Zwicker and Fastl with pure tones where just-noticeable level differences became smaller as the the SPL increased. In 1983, as workshops chairman of the AES Convention, I invited Tomlinson Holman of Lucasfilm to demonstrate the sound techniques used in creating the Star Wars films. Dolby systems engineers labored for two days to calibrate the reproduction system in New York's flagship Ziegfeld theatre. Over 1000 convention attendees filled the theatre center section. At the end of the demonstration, Tom asked for a show of hands. “How many of you thought the sound was too loud?” About 4 hands were raised. “How many thought it was too soft?” No hands. “How many thought it was just right?” At least 996 audio engineers raised their hands.This is an incredible testament to the effectiveness of the 85 dB at 0 VU standard originally proposed by Dolby's Ioan Allen in the mid-70's. It’s stood the test of time. Dialogue, music and effects fall into a natural perspective with an excellent signal-to-noise ratio and headroom. A good film mix engineer can work without a meter and do it all by the monitor. The meter becomes simply a guide. In fact, working with a fixed monitor gain is liberating, not limiting. When digital technology reached the large theatre, Dolby attached the 85 dB calibration to a point 20 dB below full digital scale (abbreviated -20 dBFS, referred to as the standard Dolby Calpoint in this document). This calibration must be measured with pink noise, with an averaging meter (not a peak meter), playing one channel (loudspeaker) at a time, and the SPL meter set to slow, C weighting. Tom Holman has recently proposed more refined ways of making this measurement, but the basic principle remains. The 85 dB SPL/0 VU/-20 dBFS standard has also stood the test of time, as digital productions can be created with excellent headroom. When AC-3 and DTS became available for home theatre, Dolby recommended that the monitor calibration standard be lowered by 6 dB to 79 dB SPL (at -20 dBFS average). This is because mixes originally geared for large theatres do not totally translate to the small venue. There is often so much dynamic range and impact from loudspeakers in a small space, that even high-powered home theatre systems (and tolerant listeners) have trouble bearing the loudness if reproduced at the Dolby 85 monitor calibration. It’s admirable that certain program producers are preserving the original 85 dB large theatre mix for posterity, but many home listeners may complain that “this DVD is too loud”, or “I lose some of the dialogue when things are soft”. This is because they turn down their monitor gains without the mix being changed, and soft passages may become too soft. To make the 85 dB-calibrated presentation palatable for such listeners, the dynamic range may have to be reduced by 6 dB (6 dB upward compression) in order to be reproduced at a Dolby cal of 79. What i find interesting in this case is the factory that i did not read anything about the following facts about our hearing system. Up to a level of about 52 decibels the hearing system is quite lineair, above that level the stapes muscle will start to contract and thereby reducing the sensitivity of our ears, thus making it quote non-linear. And starting at about 85 decibels after prolonged exposure damage to our hearing system(cochlea) will occur. This is, as far as i can remember , average levels, assuming no serious spikes/peaks. What is critical music listening from critical music recordings...the masters?